This activity leads students through a sequence of learning steps that highlight the embedded energy that is necessary to produce various types of food. Students start by thinking through the components of a basic meal and are later asked to review the necessary energy to produce different types of protein. The activity takes about one to two class periods. Behavior and design affect the amount of energy used by human society. Food is a biofuel used by organisms to acquire energy for internal living processes. 3.2 Food is a biofuel. Energy flows through food webs in one direction, from producers to consumers and decomposers. 3.4 Energy flows through food webs. 3.6 Humans live within Earth's ecosystems. Humans live within Earth's ecosystems. 3.6 Humans live within Earth's ecosystems.. This activity done with various degrees of scaffolding. Students can either follow the step-by-step activity or activity can be left open-ended for students to explore a range of answers. Another extension to this activity would be a discussion about energy use and climate change in different societies with different eating habits. Students with limited quantitative skills or Excel knowledge could be paired with experienced students. Students explore the embedded energy in various types of foods. Students calculate the amount of energy per gram of protein in common foods to find the most efficient meal. The calculation of embedded energy is provided for the students. A lot of good background and reference material is provided with the activity. 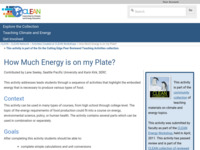 Comments from expert scientist: This is a good basic resource to allow a general audience to think critically about food sources and the energy need to produce the foods. Many of the references do not appear to have good scientific rigor. Several are found on blogs. This activity provides students with a jumping-off point to do various calculations regarding the energy required to produce various foods. This is a very engaging activity with multiple good extension suggestions and lots of hooks for interesting discussions personal energy use and the relevance of energy in our lives. This activity develops students' reflective thinking skills and critical thinking via the use of concept maps. This resource engages students in using scientific data. This activity does not include student handouts. The activity does include sample calculations. The video that is optionally suggested as part of the activity is only available at cost. HS-LS1.C3:As matter and energy flow through different organizational levels of living systems, chemical elements are recombined in different ways to form different products. HS-C3.5:Algebraic thinking is used to examine scientific data and predict the effect of a change in one variable on another (e.g., linear growth vs. exponential growth). HS-C4.2:When investigating or describing a system, the boundaries and initial conditions of the system need to be defined and their inputs and outputs analyzed and described using models. HS-P5.5:Apply ratios, rates, percentages, and unit conversions in the context of complicated measurement problems involving quantities with derived or compound units (such as mg/mL, kg/m3, acre-feet, etc.). HS-P6.4:Apply scientific reasoning, theory, and/or models to link evidence to the claims to assess the extent to which the reasoning and data support the explanation or conclusion. HS-P7.5:Make and defend a claim based on evidence about the natural world or the effectiveness of a design solution that reflects scientific knowledge and student-generated evidence. HS-P8.2:Compare, integrate and evaluate sources of information presented in different media or formats (e.g., visually, quantitatively) as well as in words in order to address a scientific question or solve a problem.